At least 6,000 protesters have marched through Haiti’s capital to demand lower fuel prices and the ouster of President Michel Martelly. Haitian police and UN peacekeepers have attacked protesters with live ammo and chemical agents as several thousand opposition supporters tried to march on the presidential palace, demanding new leadership. Haiti has seen many anti-government protests in recent months calling for President Michael Martelly to step down, amid a growing anger over the high levels of government corruption. Elections have been delayed now for years. People took to the streets again today. As the video above shows, the protest march approaching the Presidential Palace faced a barrage of gunfire and tear gas. While major media outlets have the audacity to falsely claim that Haitian police and UN peacekeepers fired only into the air to disperse the protest while on the same page show a photo of the man seen below taking aim at head height. It is profoundly clear that shots to kill were taken. Six years in the making and filmed clandestinely under the Duvalier dictatorship, Bitter Cane is a timeless documentary classic about the exploitation and foreign domnation of the Haitian people. From peasant coffee farms in the rugged tropical mountains to steamy U.S. -owned sweatshops in the teeming capital, the film takes the viewer on a journey through Haitian history to a deeper understanding of that country’s political economy. We see emerging paths of flight–industries from the U.S., refugees from Haiti – which are having profound effects on both societies. Jean-Claude Duvalier, the tyrant who ruled Haiti from 1971 to 1986, has died in Haiti at the age of 63. His death is a huge moment for political reflection on the part of the Haitian people, including the fact that so much of Duvalier’s harsh political legacy remains alive and well in the island country. A foreign, military occupation force of the UN Security Council has entered its 11th year. It serves to bolster much of the authoritarian, Duvalier legacy, which has always, at its heart, been about excluding the Haitian people from governing their own country. 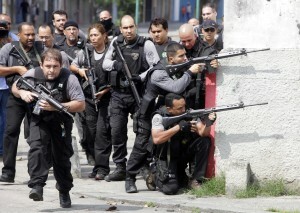 The UN mission in Haiti influenced the creation of special urban police units in Brazil—and helped the Brazilian military make up for shortfalls in its training budget. Two Brazilian experts in police work have confirmed longstanding claims that the Brazilian military and police used their leading role in the United Nations Stabilization Mission in Haiti (MINUSTAH ) as a way to train their forces for operations in Brazil’s own cities. According to Lt. Col. Carlos Cavalcanti, of the Brazilian Peace Operations Joint Training Center (CCOPAB ), the Brazilians were especially interested in the concept of permanent “strong points” in urban areas, which MINUSTAH forces used to “pacify” Port-au-Prince’s huge Cité Soleil section in 2005 and the Cité Militaire neighborhood in 2007. “Rio de Janeiro’s Militarized Police even sent a group to Haiti while these operations were still being carried out, with the object of taking in the Brazilian army’s experiences,” Cavalcanti said.